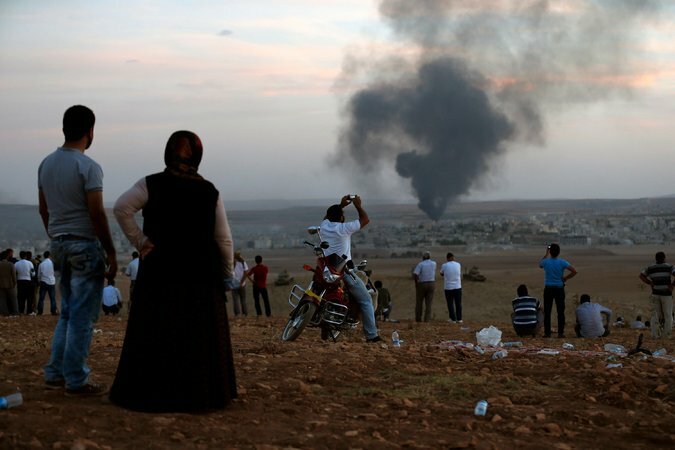 American and Turkish officials have gone back-and-forth urging each other to do more against the Islamic State’s push towards the city of Kobani. Turkish President Erdoğan has insisted that any strategy in Syria should include a campaign against the Assad regime as well as the Islamic State and has proposed the establishment of “buffer zones” on the Turkish border with Syria. These zones would include no-fly zones to protect against Syrian government airstrikes as well as create a place for moderate Syrian rebels to create a base of operations. In addition, U.S. Defense Secretary Chuck Hagel asked Turkey for assistance in the basing and training of Syrian rebels; military to military talks between the two states will continue into next week. The training and equipping of Syrian “vetted and moderate” rebels continues to be one of the coalition's primary strategies to combat IS. However, recent video and reporting has displayed the potential dangers of arming groups that work alongside non-vetted militias. In the video, members of the Hazm Movement (a secular, U.S.-vetted Syrian rebel group) fire a U.S.-supplied anti-tank missile at Syrian government tanks. While the equipment provided to these groups is intended to be used against IS targets, these rebel groups have coordinated attacks on the Assad regime with members of other groups, including the Muhajireen Army (a Sunni Islamist militia) as well as the Nusra Front (al-Qaida’s official affiliated group in Syria). Meanwhile, the German government is considering expanding its existing train and equip programs for Iraqi Kurds, but as Ali al Sarail of Al-Hayat described, long-term concerns remain over how supporting the Kurds now might disrupt the balance between the various Kurdish sects. The Defense Department announced plans to double the amount of troops from 1,800 to 3,200-- leaving open the possibility of raising that number to 4,000 if necessary-- and requesting up to $1 billion for U.S. military operations in West Africa to combat Ebola. However, the military faces skepticism from the U.S. Senate where, until Friday, the bill approving the $1 billion was stalled; Congress has now approved $750 million for six months of operations. Stars and Stripes reports that U.S. troops are now being trained in the proper use of germ-proof suits and safe engagement with infected populations instead of traditional combat tactics. U.S. General David Rodriguez announced that he believes the U.S. commitment to addressing the Ebola epidemic could last more than a year, and despite growing U.S. involvement, West African nations continue to request the international community for more funding and healthcare development. At a speech at the Atlantic Council, U.S. Special Envoy for Sudan and South Sudan Donald Booth announced that the U.S. would withhold security assistance to South Sudan until the two rival groups cease hostilities, but would continue humanitarian assistance. Ambassador Booth also called for U.N. sanctions against four South Sudanese individuals accused of blocking peace talks in the country. Concerned with a recent national security bill in South Sudan, the U.S. government is urging the South Sudanese government to reconsider the legislation that would restrict civil society and hinder the operation and formation of NGOs in the country. The Times of Israel reported that total arms sales to Africa more than doubled from $127 million in 2012 to $223 million in 2013. The sales consists mostly of airplane upgrades, air force computer systems, ammunition, drones, and radar. Notably, the Times piece came just two weeks after two Nigerians and an Israeli national were arrested by South African authorities for trying to smuggle $9.3 million to buy arms for the Nigerian intelligence service. An unconfirmed video surfaced this week appearing to confirm widespread suspicions of ties between organized crime and the mayor of Iguala, Guerrero State, Mexico. The unverified video shows a woman thought to be Mayor Jose Luis Abarca Velazquez's mother-in-law blindfolded and confessing under duress that her son-in-law cooperated with the local breakaway faction of the Beltran Leyva cartel known as Guerreros United in exchange for a payment of roughly $150,000 per month. The Mayor has fled Iguala and he and the chief of police are currently being investigated for corruption and their potential involvement in the recent disappearance and murder of dozens of local students by police forces - possibly in cooperation with members of criminal groups - following a protest over education policies. A new survey shows that the Nicaraguan army and the Chief of the National Police, Aminta Granera, are the most trusted institution and public official in the country. The survey found that among those above the age of 16, 85% expressed confidence in the army and 80% approved of Granera. Nearly 80% of Nicaraguans expressed confidence in the National Police as an institution. President Daniel Ortega also maintains a high degree of popularity, garnering an approval rating of 78%. In contrast to many of its Central American neighbors, Nicaragua has not experienced rapidly rising rates of violence and in fact has one of the lowest homicide rates in the region. A police raid on a high-rise building in Caracas killed five members of an armed leftist group known as the 5th of March Collective ("Colectivo 5 de marzo"), including the group's leader, a former policeman. Some media outlets speculated that the raid was tied to the recent murder of pro-government congressman Roberto Serra, but Venezuelan authorities have denied any link between the incidents. The building where the shootout occurred had been occupied by the 5th of March Collective, one of the many "collective" communities that have emerged to provide a remedy for the lack of basic security and other social necessities often lacking in Venezuela's impoverished urban areas. However, these groups have a reputation for responding to violence with violence and were accused of intimidating and injuring anti-government demonstrators during the weeks of chaotic protests that shook the country earlier this year. Russian military forces based in Tajikistan held anti-terror drills near the Tajik capital, Dushanbe. The exercises were held at the 201st military base, which is made up of three facilities where a total of around 6,000 Russians soldiers are regularly stationed. In a report on the exercises, Russian media outlet ITAR-TASS underlined the 201st military base’s status as the largest Russian military facility outside the country. As the war games continued in Tajikistan, Russian officials announced it will build a new military facility in Tajikistan dubbed “Armageddon.” In addition, Tajik language classes will be offered to Russian soldiers in an attempt to improve their image as a “polite people." Russia’s military has also been active in other former Soviet republics recently. This week, Russia’s Caspian flotilla held joint war games with Kazakhstan practicing the protection of maritime economic facilities, according to ITAR-TASS. After completing the exercises, the Russian warships visited the port of Bender Enzeli in Iran and sailed to Baku, the capital of Azerbaijan. Meanwhile, the Azerbaijani news agency Trend reported that the Russian military will execute large-scale military drills in Armenia from October 13-19. The increasing number of Russian military exercises and Russia’s ambitious defense acquisition plans have raised questions about whether or not Russia can sustain its high level of defense spending given the impact of Western sanctions and the country’s other economic troubles.